We've been developing our centralized IT alert management/escalation system for a while now (see: Say Goodbye to Your Pager: We’re working on a new, multi-vendor, centralized alert management product) and the good news is we're ready to welcome everyone who's interested in participating in the beta to do so. There's more info in this post, but if you already know you want in, visit the Alert Central website and sign up. It's different than a helpdesk or ticket tracking system in that Alert Central's focus is around On Call management and escalation. When you need to wake someone up to deal with an issue, when you need to be sure that something is handled promptly, when something is affecting business/people, when an issue is time sensitive, it's a good candidate for Alert Central. When you're tracking ongoing issues, requests for help or new equipment, and things that aren't necessarily time-sensitive, a helpdesk system is a great fit (we happen to know of a good one - Web Help Desk). Alert Central is deployed as a standalone virtual appliance, not an Orion module or add-on. Anyone can download and install it, and integrate it with SolarWinds and non-SolarWinds products alike. 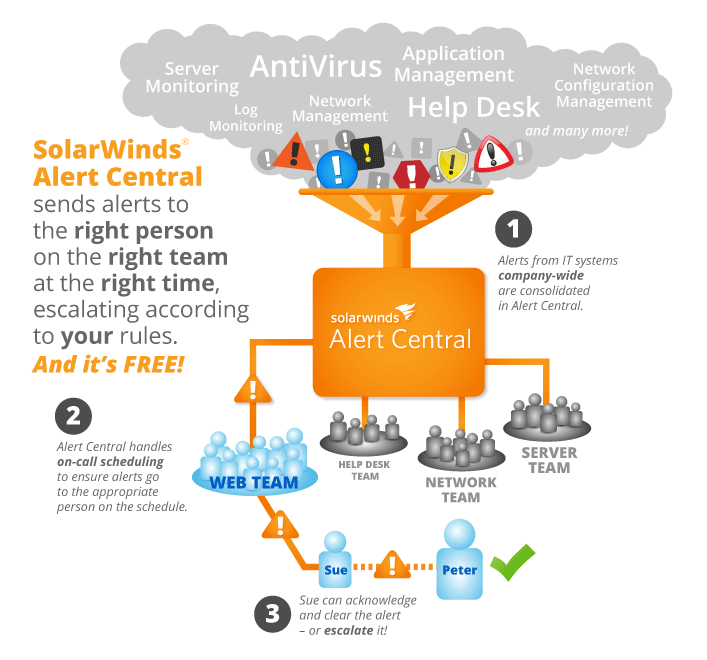 As long as your product sends emails and you want to route them to the right people, Alert Central will work for you. You heard that right - Alert Central is free. Not just the beta. The product. Free. $0. Also zero in Euros, Canadian dollars, and all other currencies. Except maybe your feedback, that is a currency we really appreciate. This handy infographic is a great visual of how Alert Central works (borrowed from the Alert Central website). Easy! Go to the Alert Central website and click the big "Sign up for the beta" links. Be sure to check out the beta contest, the winner gets a pretty sweet trip to Austin. Speaking of feedback... Take a look at the website, install the beta, give us your thoughts. Anything got you stumped? Think you ran into a bug? Think this is the best UI since Netscape Navigator busted open the web? Tell us what you think. To report bugs, issues, confusion, or praise for the beta, use the The specified item was not found. group. There's an important post there with known issues that you should be sure to check first - Alert Central 1/2013 Beta Notes.